In an era of casual comfort food, Rahul Matthan writes about what makes the experience of fine dining so singular. Sleight of hand, flavour, restraint and flourish are still only tools to present a diner with that ultimate gift – surprise. The finest piece of food that I have ever put in my mouth looked like an eyeball that had just been taken out of a cellophane wrapping – like some ghoulish boiled sweet made by an over-zealous Halloween confectionery. I have to admit a moment of hesitation when it was placed in front of me but I am glad that years of training myself not to be surprised by what is placed in front of me at a fine dining restaurant equipped me to get past my instinctive trepidation. It was described deprecatingly, as is the standard in most fine dining menus, as Oyster, Pork Belly and Kimchi – and it was all of that, just not the way one might have expected it. The Kimchi was not the pickled cabbage that is the staple of every Chinese restaurant. Instead, it had been liquidised and gelled overnight to form a crinkly golden container that looked like recently unwrapped cellophane. Into this had been poured a dollop of rendered pork belly fat, mildly seasoned and flavoured so that the fat didn’t overpower the rest of the dish. And then, like a cherry on the top, an oyster was made to perch on that white bed of fat like the pupil of a disembodied eye. The combination of the textures – the unexpected crunchiness of the kimchi, the soft warmth of the pork belly and the cool sliminess of the oyster – with the flavours of sea, meat and pickle, was almost too much to take in. As I write this, a good two years after I ate it at Benu, I can still remember every detail. Edible greens and black currant spheres encased in rose petals, Noma. Chefs today, are eclectic in their tastes and encyclopaedic in their knowledge of cultures, cooking styles and produce. This gives them unprecedented liberty to be creative and innovative about the food they serve. The result is culinary sleight of hand, mini-magical performances that take place in the kitchen and on your plate that is worth the effort to hunt down and try. I’m fortunate in that I have had the opportunity to enjoy my fair share of meals like this at restaurants around the world. At The Clove Club, in Shoreditch, I ate the most unusual suckling pig – served the way you would normally expect to eat Peking Duck, on a buckwheat pancake that we had to roll into a cylinder and pop into our mouth. What was unusual was not that it tasted delicious – you come to expect that at restaurants of this caliber – but that they could shatter my beloved stereotypes of how suckling pig should be eaten. At Stiereck in Vienna, I had a fish cooked right there on the table when they poured molten beeswax wax all over the fillet and allowed it to harden completely so that when they popped the fish out it was perfectly cooked. At Kiin Kiin, a wonderful Thai fine dining restaurant, incongruously located in the heard of Copenhagen, they recreate Bangkok street food by serving satay in a cloche filled with smoke so that when the lid is lifted it feels as if we are eating at a roadside food cart surrounded by the exhaust of Tuk-Tuks. Tartare of beef seasoned with wood ants, Noma. I love these little tricks of sight and smell, these culinary double entendres that add layers of meaning to the food you’re eating. Chefs today recognise that their clientele, particularly in establishments that sit at the top of foodie lists, have travelled the world and are knowledgeable enough to understand these cross cultural references. As a result they don’t hesitate to toy with tradition, playing with techniques and unexpected produce choices to create unusual combinations that force us to question our expectations of the food we are being served. No-one plays this game better than Gaggan, whose Chennai King – whose seared scallop was designed to evoke memories of a South Indian breakfast, served as it was with spiced sambhar foam and a generous heap of gunpowder. This is an inside joke at so many levels that only an Indian will truly understand its every nuance. Beets on Crisps dusted with Brined and Smoked Foie Gras, Amass. With all this smoke and mirrors it is often easy to forget that at the heart of every good fine dining experience is the food – wholesome, well-balanced plates that taste delicious without being over-powering. And the secret to this is often restraint. Some of the most memorable dishes I have eaten stood out for their simplicity. 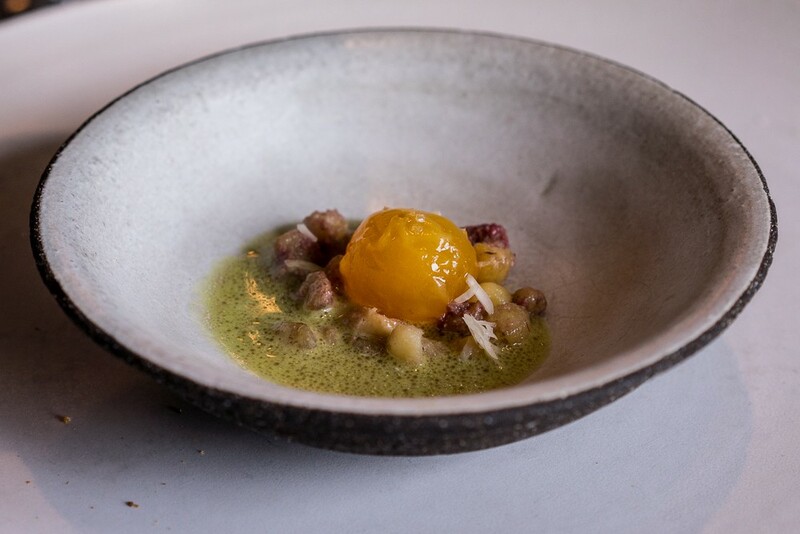 At Amass, Chef Matt Orlando, serves an exquisite egg dish that is heart-stoppingly delicious in its minimalism. The centre-piece was an egg yolk – cooked sous vide at 63 degrees centigrade so that it was the texture of soft toffee. The yolk was suspended in a slightly sweet spicy broth of grilled corn and black pepper oil so that the combination of texture and taste was like nothing I’d tasted before. In Gastrologik, a surprisingly under-rated restaurant in Stockholm, I ate a chargrilled Asparagus by dipping it into an absolutely delicious puddle of animal fat rendered down to an unctuous white cream that was sinful but simple. These are immaculate dishes presented without flourish stripped down to just the essential elements – but simply bursting with flavour. 63-degree egg yolk served in rose oil sauce with vintage potatoes, Noma. As your palate gets used to food like this, you begin to spot, even if you know nothing about cooking, minor aberrations on the plate. You develop an sixth sense about the role that texture, temperature and taste plays on the plate and can intuitively tell when something is off. Even the best restaurants have dishes they could have put together better and after you have eaten enough high quality food you tend to be able to spot them instantly. When I ate at Per Se in New York, I was aware of Peter Wells’ devastating review of the restaurant but I was hoping time had healed a broken reputation and that a Thomas Keller restaurant whose original head Chef, Corey Lee, was the man who came up with the oyster eyeball I started this piece with – couldn’t be that bad. You could tell the moment you walked in and saw the empty seats that this was not a restaurant at its prime. But ultimately, it was the food that let the restaurant down. Dried reindeer moss dusted with cep mushrooms, Noma. There are a fair few restaurants like this, either past their prime or pretentious without reason. If you start down the fine dining path you are going to come across them sooner or later. Today, it seems everyone is trying their hand at this format. Restaurants are falling over themselves to produce plated seven course meals in an attempt to tap into the "fine dining" craze that seems to be all the rage. But most part-time kitchens do not have what it takes to be able to deliver quality food at this level. And if that is your first experience you might well give up on the whole concept. But that doesn’t mean you have to travel far afield to taste food like this. Some of my favorite meals have been in my backyard in Bangalore. Most quality chefs delight at the opportunity to serve a quality meal to a table of people who will truly enjoy it. You just have to find them. At Olive in Bangalore, Manu Chandra has consistently delighted me with some of the best, most originally creative meals I’ve ever eaten – including an entire meal where every single item on the menu was the opposite of what it appeared to be. Indian Accent in its original avatar in Delhi was quintessentially Indian and yet quite recognisably unique in its approach to cooking. Earlier this year I had the good fortune to eat at Masque in Mumbai where they are brave enough to build the entire restaurant around the concept of the fully plated meal, offering no a la carte options whatsoever – and I have to say the food was exceptional. So why do I do it? What makes me spend hours of research on where to eat every time I visit a new city? Mostly because I get a particular kick out of discovering unheralded gems like The Greenhouse, a little known gem in Hays Mews in London, or Ms. G, in Sydney. But mostly it is because I think of fine dining as a form of performance art – the kind that allows for the most intimate level of audience participation. When I am eating at a fine dining restaurant, I am putting myself in the hands of a kitchen for two to three hours giving them the liberty to delight me and yet risking, every time, that they will not. Perch, new potatoes, dill and chives, Gastrologik. Some kitchens, like Mugaritz, have a peculiar idea of what this means – their meal unravels like a Salvador Dali painting, surprising us every step of the way. Instead of ending with dessert, the last plate at this most highly rated restaurant in San Sebastián was a single large red dot of savory sauce on a plate that we were expected to lick clean with our fingers. 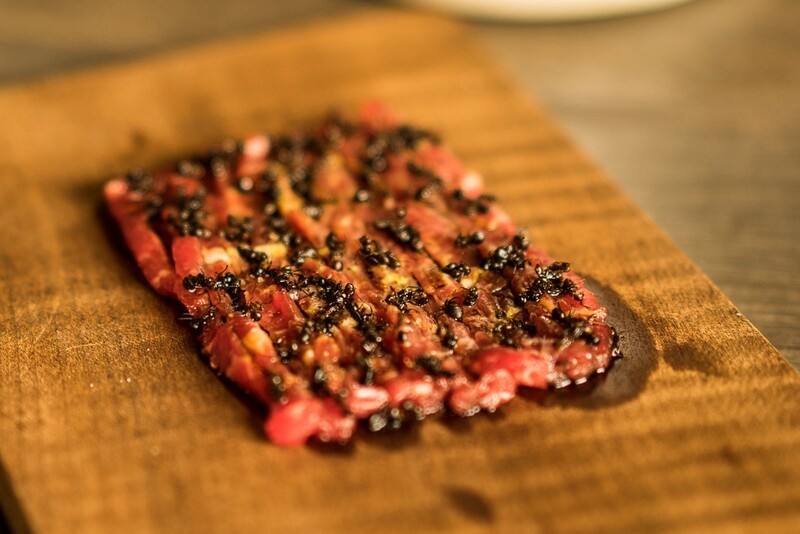 Others like Noma use the brilliance of their science to dazzle you, doing things like seasoning their steak with flash frozen fire ants that imparted an unusually astringent citrus flavour to the meat. You never know what is going to happen to you when you walk into a fine dining restaurant of this quality – but that is what it is all about. Rahul Matthan is a technology lawyer and a partner with Trilegal. Food is a side project – but one that he is pursuing with increasing tenacity. Follow him on Twitter here.